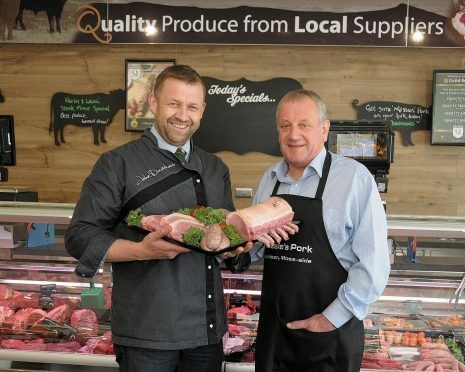 The number of butcher shops across the north and north-east has been chopped in recent years as customers favour supermarkets over the traditional outlets. There were 45 butcher shops in Aberdeenshire in 2010, compared to 35 today, while that number has dropped from 20 to 15 in both Moray and Aberdeen in that time. Five shops have closed across the Highlands over the past eight years, bringing the total from 40 to 35. The Western Isles has experienced a 50% reduction, with numbers dropping from 10 to five. However, all five butcher shops recorded in both Orkney and Shetland in 2010 are still surviving. Bosses at Anderson Butchers, which has premises in Lerwick and Whiteness on Shetland, reckon the company has benefited from there being only two supermarkets on the island. But business manager Jay Joubert also thanked its loyal customers. Mr Joubert added that the business is experiencing a boom this week as customers prepare for the Up Helly Aa by stocking up on traditional staples of the event, salted beef and mutton for reestit mutton soup. Despite a general reduction in the number of shops across the north-east, some are managing to thrive and have recently won awards for the quality of their produce. Inverurie-based Davidsons Specialist Butcher won top prizes for its haggis and pork products at a Scottish Craft Butchers ceremony earlier this month. Owner John Davidson believes the key to survival is “keeping ahead of the curve”. He said: “We have to be more creative and modern, and produce more diverse products than people can buy in supermarkets. Chris Mallon, chief executive of the National Beef Association, claimed “very aggressive tactics” from big chains are forcing many small businesses to close for good. Douglas Scott, chief executive of the Scottish Federation of Meat Traders, added: “When butchers have become smarter, focused on changing consumer tastes and provided convenient kitchen-ready products, they are in no threat of closure. “If you turn the clock back 50 years, you will find that butchers shops are the great survivors of the high street. Could government cash injection revive struggling high streets across the north and north-east?